As most of the people who have hung around me know, I used to love making YouTube videos and uploading them. It was a blast! I thought ninty-percent of my videos were of questionable quality though, and I ended up getting a little burned out on it for a while there. But now that's about to change! 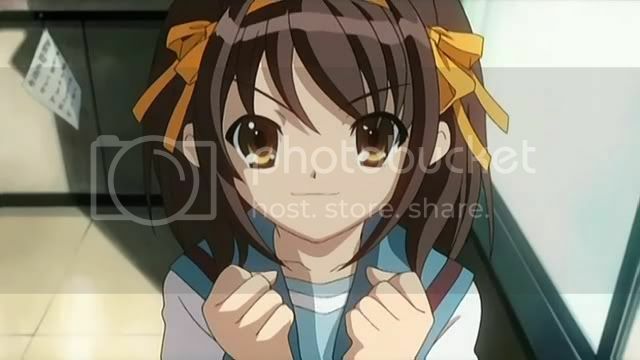 I swear that this will be the last Haruhi pic for a while. I swear! .... Why does no one believe me?! I really want to start over with my YouTube thing though. I'm going to be starting a new profile and everything, although I'll alert my previous subscribers that I'll be moving (and I won't be taking my old vidoes with me). Unfortuantely, I don't think they'll be so understanding. They're an awesome group, but they can be a little needy at times. But seriously, I love you guys! I just never want to make another Kingdom Hearts video! So anyways, now I'm super tired (I got up at six o' clock in the morning). I'm going to clean the bathrooms now, you know, wake me up to reality. :) Planning to finish my video tonight, then launch my new YouTube account. Fun fun fun, every waking minute! Will update tommorrow. You had such a following going on the other one, lol. People kissed the very ground you walked on! SOMBRERO MAN!! Is there still a link somewhere to that? I need to advertise that gem.